The mischievous monkey king and his immortal peach. A few months ago I wrote about the company Tekker Ink and their ability to create custom inks based off of hex codes. After writing the post I decided to go ahead and ordered a couple of colors. I'm not going to do a review of the inks themselves; there are plenty of them out there. I wanted to take a minute and talk about my first choice which I named "Immortality" after the immortal peach. When I shared the ink with people on Instagram and in the Fountain Pen Ink community I got a lot of questions about the color and why I named it "Immortality" so I thought it was a good opportunity for a little history behind the color. The color peach and the fruit itself has a long symbolic history in Asian culture. The symbolism of the fruit and the peach color are as prevalent in Asia as the apple is in Western cultures. The fruit itself originated in China and our modern word for it comes from the latin persica which means "the fruit from Persia." In China it was believed that the peach fruit would grant immortality and as such is featured in a great many works of art and legends. 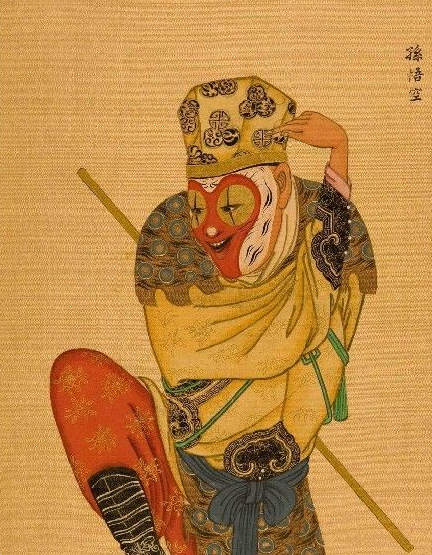 My favorite of these is the story of the Monkey King; he was an extra smart monkey, who rose up to be very strong and leader of all monkeys on earth. Eventually he got so strong that the Gods invited him into heaven. Monkey thought he was going to go hang out and be a God himself, so he was very displeased to find that they were making him a stable boy. Angry at what he saw as the God's unfairness he rebelled. He talked his way into the Jade palace and tricked the guards into leaving him alone to "nap" in the peach trees and promptly gorged himself on the peaches, believing that by doing so he would become strong and immortal and therefor, untouchable by either Gods or the hand of fate. While he did become immortal, he paid a high price; he was imprisoned in a mountain for 5,000 years and was only released to work as an indentured servant of sorts after that. So while Monkey did live forever, it was mostly unpleasant. And although he was stronger than the Gods he rebelled against, he still wound up imprisoned. Which just goes to show, strength isn't everything and a singular moment of hubris can lead to downfall. Not to mention forever isn't as appealing as we think it might be; especially when stuck inside a mountain. The Japanese also have stories surrounding peaches, most notably the story of the boy who was born out of a peach and grew up to save his village from Ogres. There is also the story of a God who descended into hell to reclaim his dead wife and was pursued by demons when he left. He used peach fruits to drive off the demons. Because of this, peaches are not only associated with good health and longevity in Japan but are believed to ward off evil. To create my color I worked from images of traditional asian peach varieties to try and match the color shift that happens between the pink and peach area of the fruit. I decided upon a hex-code that was a little more desaturated because knowing what I do about how the mind processes color, I figured the slightly duller color would be easier on the eyes. The color that I wound up with was very close to my starting color and I have to say I'm very happy with the way it writes and dries down. Its legible and with the right balance of peach and pink. Feel free to use the hex code to have your own ink made if you like the color! While it won't make you live forever, it will provide a pleasant writing experience. And as the Monkey King could attest, short and happy is better than long and miserable!